An emergency ban on catching seven bottomfish species in the main Hawaiian Islands will take effect for five months beginning May 1. The May-September seasonal closure is supposed to help onaga, ehu, gindai, opakapaka, kalekale, lehi and hapuupuu stocks recover from overfishing, its supporters say. Both commercial and recreational fishing will be banned. During those months, the onaga or opakapaka on restaurant menus and in stores will have to come from the Northwestern Hawaiian Islands or be imported. "I'm hopeful all fishermen recognize that this is a process to help protect the fishery," said Peter Young, director of the state Department of Land and Natural Resources. But some commercial fishermen, including Capt. Guy Ohara, wonder what happened to an earlier plan to close certain areas instead of the entire fishery. "How can they close down everything?" Ohara said yesterday from aboard the bottomfish vessel Ka Imi Kai. "I figure they're trying to shut down fishing." This summer, the livin' will be easy for seven kinds of bottomfish in the main Hawaiian islands. No fishing -- commercial or recreational -- will be allowed for onaga, ehu, gindai, opakapaka, kalekale, lehi and hapuupuu. State and federal regulators who are planning the unprecedented ban hope that the fishing respite will allow fish to breed and replenish stocks that have been dwindling for decades. The Western Pacific Regional Fishery Council approved the measure Friday, and the state Department of Land and Natural Resources and National Marine Fishery Service are expected to formally announce it soon, officials said yesterday. Fishing boat Capt. Gary Dill called the measure "pretty extreme," but said it is needed because "things went too long unattended." Although the emergency ban is set for May 1 to Sept. 30 this year only, Dill said he expects the summer closure will be repeated in future years, "at least until it is obvious that the stocks have indeed recovered, if in fact they do recover." About 612,000 pounds of bottomfish were landed in the Northwestern and main Hawaiian islands combined in 2004, with a majority of the catch being made in the Northwestern Hawaiian Islands by a small group of fishing boats. At current fishing levels, "the main Hawaiian islands are not sustainable," said Dan Polhemus, DLNR administrator of aquatic resources, when his division announced in December it was changing the boundaries of 12 areas in state waters permanently closed to bottomfishing. The new, seasonal closure will be in addition to those closed areas. The greater steps are required to meet federal regulators' goal of reducing bottomfish catch by 24 percent relative to the catch in 2004, the Western Pacific Regional Fishery Management Council said in a release announcing its recommendation. 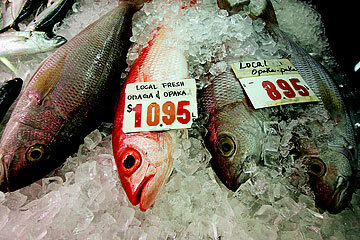 Earlier efforts were targeting a 15 percent reduction in catch from the 2004 harvest. The goal was changed because of revised National Marine Fisheries Service assessments of Hawaii bottomfish stocks. "We're quite pleased that Westpac (the fishery council) moved to put the closure in place quickly," said Bill Robinson, NMFS administrator for the Hawaiian Islands. "Overfishing has been going on for some time." Robinson said he believes many fishermen realize something has to be done "to protect the fishery for themselves and future generations." But fisherman Guy Ohara, captain of the bottomfishing vessel Ka Imi Kai, worries that the temporary ban is another foot in the door toward a total ban. "They've already closed zones, and now they want to take five months away," Ohara said. Chefs Ronnie Natsui at Roy's Restaurant and Hiroshi Fukui at Hiroshi's Eurasian Tapas both said they expect the closure will affect their menus. Bottomfish will come either from the Northwestern Hawaiian Islands, where limited bottomfishing in the Papahanaumokuakea Marine National Monument will be allowed for four more years, or imported from other countries, they said. "It's going to force us to buy imported fish," Nasuti said. "If it means not having (a fish) on the menu because it's scarce, then that's how it has to be." The loss won't be as great for the restaurant or consumer as for the fishermen, he said. Glenn Tanoue, fish buyer for Tropic Fish and Vegetables, learned yesterday of the coming ban. Though he already buys some imported bottomfish for his retail and wholesale business, many customers prefer fish caught in Hawaii's waters, he said. Though the volume of onaga and opakapaka sold may not be great, "it's important culturally," and customers expect to have the option, Tanoue said. He and others did allow that a summer closure would be less disruptive than a winter one, when red-fleshed bottomfish are popular for Thanksgiving, Christmas and New Year's celebrations.